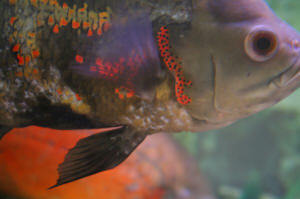 Like almost all infectious disease of fishes, Oscar's are principally secondary. That is, they are predetermined by adverse conditions.... principally poor water quality and a lack of nutrition. Fix these first and usually infectious disease will sort itself out. Hello! My husband and I have rescued a tiger Oscar from a young couple who had him in a tank with NO filter. We put him in an immediate quarantine tank when we got him home. His story... He is about 10 inches long and the couple had him in a 55 gallon that was only filled about 50% (again with NO FILTER.) The water looked like watered down milk. To top it off, they had McDonald's happy meal toys as decorations in the tank. While we were there, their children were chucking random things into the tank! Food, sippy cups, toys... Seriously... you name it, it was in there. This guy is in bad shape. His gills and mouth are swollen and he can only open one side of his mouth.. And as you know, these guys are supposed to be black and orange. He is a very pale grey and his orange is an off white color. His poop is clear and stringy. We have tried API salt, slight water changes, and we have just started running an antibiotic in the tank. But we still cant get him to eat, he barely swims or moves around. He has sever indents on his head (no holes) and one side of his face is distended (the same side that he cant open). The spines on his dorsal fin are also exposed, and he has some slight tail rot. We have done everything we can think of to try to bring this guy back to being healthy. Any help or ideas would be grateful Thank you for you time. <Sounds like this guy has, among other things, Finrot and "Hole in the Head". 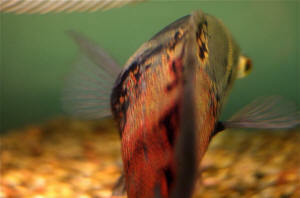 Finrot is treated, usually very successfully, with antibiotics. Hole in the Head is trickier, and requires something specific: Metronidazole. You can use the two medicines together, though the Nitrofuran group of antibiotics works especially well with Metronidazole, so if you can use these two together, do so. Don't forget to remove carbon from the filter, if you use it (carbon removes medicines as well as things that colour the water). Do remember to provide optimal conditions in the tank, especially oxygenation. In the short term, food isn't that important, and if he can't eat, don't worry about it for now. He can go several weeks on his body fat. Thank you so much for your swift reply. We will be getting that in the morning! We will keep you updated as to what happens, if there is any developments and if we have any further questions! Thank you again. I wanted to let you know that I discovered a hole right above his eye, it looks like someone had thrown a dart at him. It's extremely deep, but small in diameter. I went to the store and bought some Metronidazole. We have started that process, hopefully he pulls through! Thank you again for the advice! I'll keep you updated. Hello...I've been through many, many pages on your site and I want to thank you for being such a valuable resource! going away. Now his pectoral fins seems to be a little frayed and maybe some slight if any cloudiness in his eyes. Has my Oscar developed even more illnesses do you think? I rarely ever have sick fish so I'm not sure what to do. I appreciate your help and time. Thank you. < Your Oscar is suffering from an internal infection. Usually this is because of a blockage in the gut of the fish. 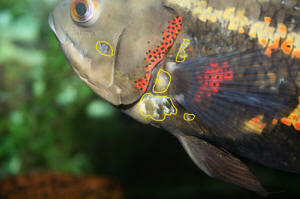 Nobody knows for sure what causes this in cichlids. Some think it is water conditions while others think it is diet. There is probably a little of both that cause this condition. Do a 50% water change, vacuum the gravel and clean the filter. I noticed another thing on my Oscar. At the end of its tail its white and the edges look like they're torn. Is it Bacterial Fin Rot? What should I do? 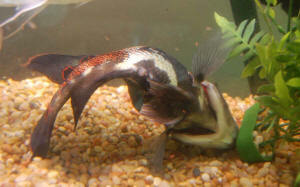 Hi Bob, I have two tiger Oscars that are about 4" - 4.5" long. I have had them for about 1 and a half months now and everything was fine until yesterday. My favorite one, "Rocky" started getting a blackness on his head and it even looks like a scale is coming up. I got them from Pet Smart, when I set up the tank they gave me aquarium salt and conditioner that is also a stress reducer. The tank ran and built up the proper bacteria for about 4 weeks before I put them in. I gravel vac every other day but I never take a lot of water out. I have them in a ten gallon tank (I know too small but my 58 gallon is still setting up at this time). I don't understand what is wrong with him, he is the one that already eats from my hand and know who his daddy (owner/master etc.) is. I did a 3 gallon water change and added the proper dosage of stress coat in it, but it looks worse here are the pics. this one he is perfect (the one on top) Here is the bad (the one on bottom) and the tail. Oscar Problems - Chuck out..
What caused this infection and how can I prevent it from coming back? Hi, I just bought 2 baby tiger Oscars 4 or 5 days ago. They seemed fine when I saw them at Petco and when I put them in their new 10 gallon home. I have a plecostomus too. These past 2 days my tiger Oscars have been acting strange...I'm feeding them "Oscar bites" (micro pellets) and they're only eating one pellet each. The pellets just lay on the rocks and in the holes of the filter. Hi guys, Firstly top web site very informative and I'm happy to say that I seem to be doing everything correctly. My question is this. I have noticed two small reddish brown spots on one fin of one of my tiger Oscars (I have two at about 3" long and two albino's at 4" long). I have seen lots of reference to white spot / Ich and have had to treat for this in the past, but learned my lesson well. I have not been able to find any info about brown / red spots. The Oscars behaviour seems to be absolutely normal, active eating well etc. What could this be? Do I have anything to worry about? Many thanks in advance guys, look forward to getting your answer. Dear WWM Crew, I have written in the past regarding an "upside down" Oscar, who is still alive, but seemingly not well. I strongly believe that he has permanent swim bladder damage b/c he does not float and has been on his side at the bottom of the tank for some time now. In addition, there is a permanent small distended area around his rectal area, which can vary slightly in size. I clean the tank one a week (30 gal.) and use Epsom salt each time because it seems to help keep the distention at bay. I have not tried any other treatments. He still eats very well and can swim, although only with major effort and tires so quickly that I often end up pushing the food toward him to help. It is very upsetting to see him in this state and I worry that he his suffering. I've considered Euthanizing and you have suggested that freezing is the most humane, but I don't see how since he will be removed from the tank he has resided in for several years and placed in a dark place that get progressively colder. Perhaps, I'm thinking too much (my husband complaint). Any suggestions? Chuck, Thanks so much for your reply. I do want to clarify that I have in the past tried to medicate. This condition has been an issue for almost a year now and the last time I was in contact with your awesome crew, he seemed to show promise after the initial Epsom salt treatment, he was even floating on his own. However, not too long after he took a sudden turn for the worse and has never recovered! He is over five years old at this point. Anyway, thanks for your advice. Would you agree that he would be better off in the Seltzer-seltzer bath at this point? Good morning. Another follow-up on our Oscar. Since my first email below, we gratefully took your awesome advice (as it turns out) and treated Oscar with the Epsom salt twice along with a water change. The good news is that he's had a couple successful (and quite healthy) bowel movements and the swelling on his belly is more or less gone. Naturally, we are thrilled. The only problem now is that he is now laying on the bottom of tank. That is, he's not upside down, but flat on his side (his poor eyeball!). However, with what seems like a ton of effort he will swim to the top of the tank to get food (no more hand feeding with wooden skewers), but as soon as he gives up trying he sinks. if either the swim bladder was affected for too long or haven't been swimming? If so, will he ever swim again or will he be doomed to the bottom of the tank for the rest of his life? Thanks in advance for your help. I look forward to hearing from you. >First, I would like to thank you for taking the time to read this...but I will get right into it. >I have 2 Oscars (one white tiger and one classic tiger). I have had them for maybe 4 months and I have been very active in their environment. They have been growing very quickly and were very healthy until recently. Let me give you some background. The classic tiger has always been the bigger of the two and now is maybe 6 inches head to tail. This one is very strong and healthy. The white tiger is maybe 4.5 - 5 inches in length and was always more active but is now very sick. >>To be expected with the kind of breeding necessary to achieve amelanistic animals. >I regularly do partial (15%) water changes and test my water very often. All of my levels are perfect. They are in a 55 gallon tank for right now, but I'll be getting a larger tank very soon. At first they were only getting fed feeder fish and frozen bloodworms. >>Nix the feeders, ASAP. They're a fantastic way to introduce disease, and NOT at all nutritious, even if you gut-load. Bloodworms are fine, but not as a staple. and try to stay away from feeder fish. I love these Oscars like part of the family and would hate to see the white tiger become fatal. So if you can help me, it would be greatly appreciated. I have searched the archives and have found very little information about this. From what I have read, I suspect that my Oscar may have this "whirling disease". He has stopped eating for the last week or so. I normally do weekly water changes of about 15%. Because of his symptoms, I have done three water changes during the last week totaling probably about 60% I have been using Melafix for the last few days , but have seen no changes. He is breathing heavy, mouth opening and closing. The other fish in the tank (2 large tinfoil barbs and a Synodontis cat) remain normal. possible cure? I hate seeing this graceful creature suffer like this. I have a 55 gallon tank with a red Oscar and a Plecostomus which are both at least five years old. 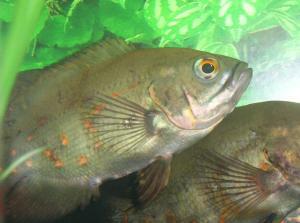 The Oscar is about 10 inches long and the Plecostomus is about a foot long. The Oscar looks as if it's pregnant. It is blotted and has clear looking eggs coming out right under his stomach. I know that this is not possible but I have seen fish eggs and that's what it looks like. It's not acting any different, but I'm worried about the clear eggs coming out. Please help me. We have had them so long I would hate for anything to happen to them. My girlfriend and I have an Oscar that has had pop eye for at least three weeks. It started with the one eye and now the other eye is beginning to bulge. He is eating very little, if at all. We have him isolated in a separate tank (none of the other fish have any symptoms). We have been treating him with Maracyn Two and have completed the second treatment, but it seems he is getting worse. White spots have appeared on his body. Should we continue with treatment? Switch the treatment? What could this possibly be? HELP! Please let us know if it is time to say good-bye.